The Surat on Balonne Gallery (formerly known as the Balonne River Gallery) was opened in 1997. The Gallery's vision then (and remains the same today) was for the development and promotion of local and regional artists through gallery space and curatorial assistance in a formal gallery setting. Over fifteen years and 120 plus exhibitions later the gallery's annual exhibition schedule continues to read like the Who's Who of regional artistic talent. Featuring a diverse range of art forms, styles and techniques, as well as the occasional well known artist from further afield - don't be surprised to see such well recognised artists as Sidney Nolan, Russell Drysdale or Hugh Sawry!! 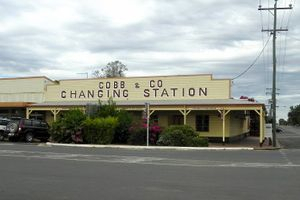 The Surat on Balonne Gallery is housed in the Cobb & Co Changing Station complex. This complex is also home to an amazing 25000 litre freshwater fish aquarium, where river dwellers swim in a simulated riverbed environment; an incredible socal history museum featuring a working Cobb & Co Coach; Public Library; QGAP and Centrelink Agent.